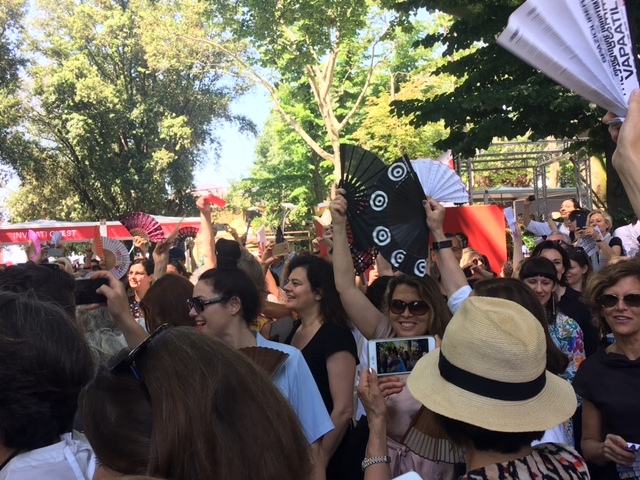 This morning at 11:00 AM, a large crowd of women (and male supporters) met just inside the entrance gates of the Biennale’s garden to protest a lack of recognition of “woman in architecture.” The fan waving crowd cheered as co-organizer Martha Thorne read a prepared statement asking for women to receive more recognition and support from the profession and the media. 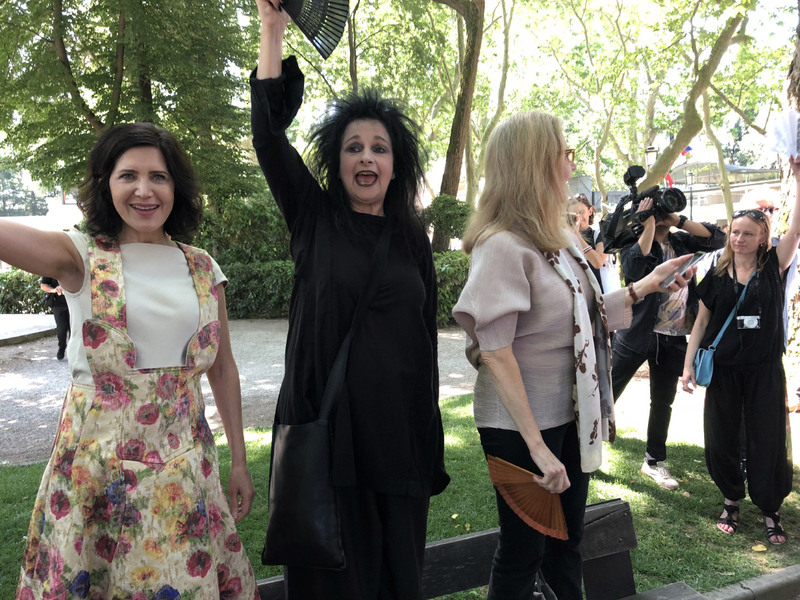 The event, according to Thorne, Odile Decq, and Toshiko Mori, three of the original organizers, started with this small group but has quickly developed into a network of “hundreds of supporters!” The only slip up was that the protest took place inside the gates of the Biennale and thus many young supporters were denied entrance to participate as they did not have a ticket on this media-only preview day. Still, over 100 people participated, including Francine Houben of Mecanoo, Farshid Moussavi, Jeanne Gang, and curators from The Met and MoMA. 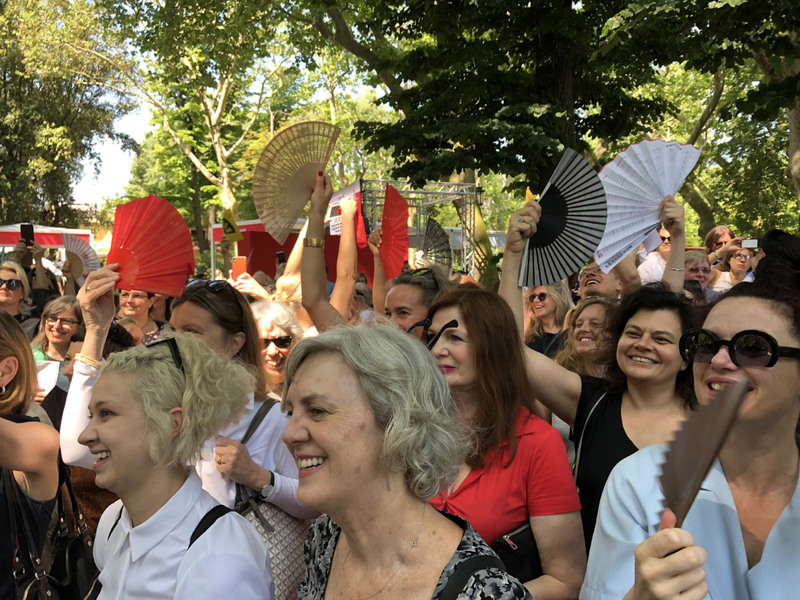 The organizers claim that architecture school students are now 60% female, so that today’s “Giardini” protest is only recognizing what will become a reality tomorrow. We as Voices of Women are building conversations and taking actions to raise awareness to combat pervasive prejudices and disrespectful behavior that appears to be systemic in our culture and discipline. We are united in denouncing discrimination, harassment and aggressions against any member of our community. We will not tolerate it. We will not stand silent. Women are not a minority in the world, but women are still a minority in the architecture field and we want it to better reflect better the world in which we live. The Venice Architecture Biennale 2018 FREESPACE is a crucial moment of awakening to promote equitable and respectful treatment of all members of the architectural community irrespective of gender, race, nationality, sexuality and religion. We will join hands with co-workers, students, clients, collaborators, and our male colleagues to create a new path forward toward equitable work and educational environments that promote respectful discourse and open exchange of ideas.